I’ve had almonds on the brain lately. 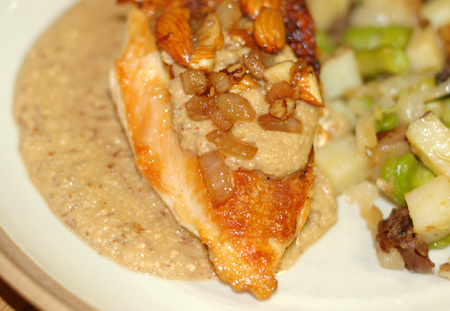 Somehow when I started planning last night’s meal, which I knew would be including skin-on chicken breasts and fresh fava beans, my mind went straight to an almond-based dish with a Latin heritage, pollo almendrado. I cooked the version above last November and it made a very hearty, warming meal served over rice. This time around, I simplified the sauce, cooking onion, garlic and chopped almonds in the pan drippings from the chicken. After deglazing the pan with white wine, I reserved a few tablespoons for garnish and then pureed the sauce with chicken stock to get as smooth a texture as I could—a messy proposition since my Cuisinart is out of commission and I foolishly opted to use a mini-chopper for the task instead of my blender. It could have been smoother (and I might consider trying this dish with almond butter in the future), but the flavor was excellent. 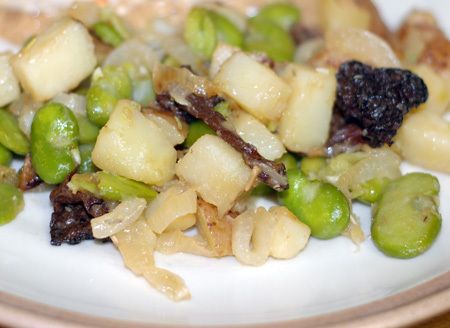 To accompany the chicken, I made a hash of fava beans, red potatoes, caramelized onion and a few dried morels. 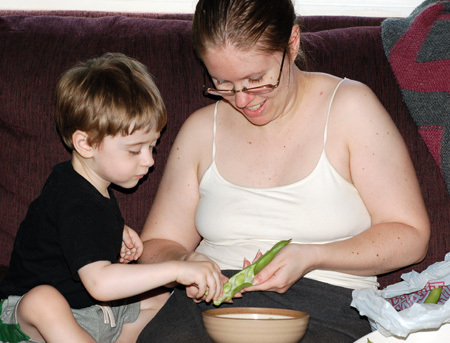 My son was fascinated by the fava beans in the wake of his favorable introduction to shell peas. He sat next to me and diligently plucked every bean from the pods as I split them open. This was a perfect task for little fingers, especially since the beans needed peeling afterwards anyhow, and I was really tickled that the beans all made it into the bowl (as opposed to all over the room, which I had half-expected). As we worked, he kept trying to nibble at the beans but the tough skin was thwarting him, so I peeled half a dozen with my fingernails and we ate them raw like peas, enjoying their similarly crisp, green flavor. For the hash, I first caramelized half a sweet onion and soaked a few dried morel mushrooms, then cooked the favas with cubed potato in the mushroom soaking liquid until just tender. A sprinkle of rosemary and a touch of white wine vinegar rounded out the dish. This was a great way to stretch my precious stash of fava beans a bit further while complementing them with the earthy mushrooms, sweet onion, and piney rosemary, and it played well with the nutty almond sauce to boot. Once the chicken is done, remove it to a plate and cover it with foil to keep warm; pour off all but 2 T of chicken fat (or add that amount of oil if you used boneless breasts), and saute the other half of the onion, along with the chopped almonds, in Skillet B. Meanwhile, reheat Skillet A and add a fresh splash of oil, plus the potatoes, favas, drained and chopped morels and 1/2 C of their soaking liquid. Crumble the rosemary in with your fingers, cover the pan, and cook until the potatoes and favas are tender, about 5 minutes. Remove the lid and allow any remaining liquid to boil off. When the almonds in Skillet B are toasted, add the garlic and saute just until fragrant; remove 2 or 3 tablespoons of this mixture for a garnish, then deglaze the pan with white wine and allow to evaporate. Scrape this mixture into a blender or food processor and add a cup of chicken stock; process until very smooth and return to Skillet B to warm through. You can adjust the consistency of the sauce at this point by letting the sauce reduce or adding a bit of additional stock; it should be about as thick as a cream sauce. Add the caramelized onions and a tablespoon of butter to the hash in Skillet A when the pan is dry, and melt in a tablespoon of butter to mount the almond sauce in Skillet B when it has reached the desired thickness. Season the hash with salt and pepper and a mere splash of white wine vinegar, scraping the skillet to bring up any browned bits. 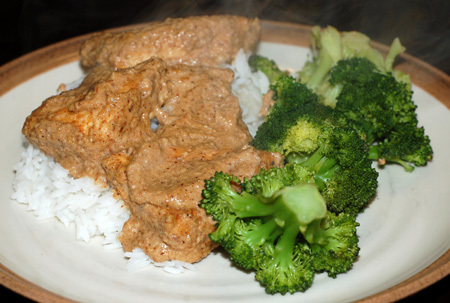 Taste the almond sauce and adjust seasonings if necessary. Serve each chicken breast in a puddle of sauce, topped with some of the reserved onion-almond mixture, with the hash alongside.